5793 labyrinths found. Showing 4441-4460. Sorted by country, state, city, then zip/postal code. From Front Street in downtown Fremont, turn right on Tiffin Street, turn right on Canfield Street, labyrinth is located at the top of the hill on the right. Located in the healing garden at the hospital - Holzer Medical Center is located at the intersection of Ohio State Route 160 and US Highway 35 in southeastern Ohio. Dual-path Reflection Labyrinth designed for the year 2000 - the first ever permanent reflection labyrinth installation. Labyrinth is on private property and visitors are is advised that access is over uneven ground. Owners not responsible for accidents. The Open House, 204 N. Mulberry St.
Builders are Denison Alumnus Robert Ferre', his wife Linda and a crew of Marty Kermeen, Chuck Hunner, and Lars Howlett. Between Wilson Mills Rd and Ridgebury west of Brainard. Please avoid weekday mornings during school year and Sunday mornings when the parking lot is in use. This labyrinth is located in a city park at the edge of Bowling State University, Firelands branch. From I 90 east or west, get off at Rye Beach Exit, turn south 1/2 mile to University Circle. Park in back right corner of parking lot, proceed on foot through butterfly garden, bearing left to wood line. Follow path to Labyrinth clearing. 41.401551° N° Lat. ; 82.597632° W° Long. 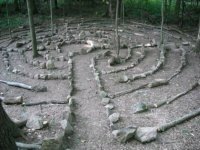 The Prayer Path and Labyrinth sits on 10 acres of wooded land. There is a finger labyrinth for the visually impaired or for those who have trouble walking. There are benches frequently placed on all four walking paths and at the center of the labyrinth. There are also prayer boxes at most benches. Open dawn to dusk 7 days a week. A walking path only, no motorized or pedaled vehicles. N 41° Lat. ; W82° Long. Picture from walking path looking at people walking the labyrinth at John Brown Tannery Park in Kent, Ohio. When parking in the circular drive at John Brown Tannery Park, you can walk down the stairs towards the river and look to the right amongst the trees. It will look like a lot of grass and a clearing, but there is actually a labyrinth made of bricks set into the ground. It is level with the grass so you won't see it until you are almost on top of it. 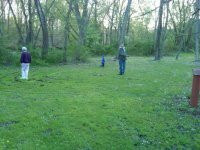 Please call Lakewood United Methodist Church at 216 226 8644 to confirm dates and times when the labyrinth is available for walking. Currently the labyrinth is open the first Wednesday of every month from 7 pm to 8:30 pm and Thursday, the following day, from 9 am to 5 pm. First Wednesday of the month, and the following Thursday. The labyrinths on our property are temporary and seasonal. We create them for 2-4 week periods around the vernal and autumnal equinoxes and the summer and winter solstices. If you wish to walk our labyrinth, please contact us by email, or by knocking on the front door of the house. As this is a temporary labyrinth, it can change in type. Our Vernal Equinox 2006 version was of a classical, left opening design. Procter Center is a retreat, recreation and event center affiliated with the Diocese of Southern Ohio. Located 5.5.miles north of I-70, Exit 75 (SR 38); or 10 miles south of London, OH on SR 38. 39.45 N° Lat. ; 83.28 W° Long. 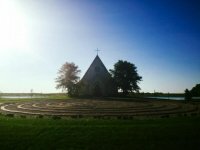 We also have an indoor Chartres style labyrinth that is available at a nominal charge and a reservation.